The All Blacks are to pay homage to their country’s most famous rugby jersey which Saracens owner Nigel Wray paid £180,000 to buy and is on display at Twickenham’s World Rugby Museum in the build-up to Saturday’s test with England. Wray has temporarily loaned the jersey Dave Gallagher, captain of the legendary 1905 “Originals” wore in the defeat by Wales – the only loss on that 35 match tour – to the museum. 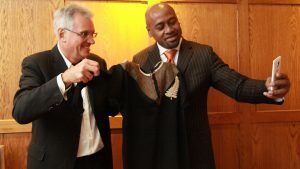 Wray outbid five New Zealanders in 2015 to own the jersey which is part of his extensive sporting memorabilia collection that includes the jersey Jonah Lomu wore when destroying England in the 1995 World Cup semi-final in Cape Town. The All Blacks will travel from their Lensbury base in nearby Teddington to the museum to see the special display marking the England v New Zealand match which coincides with the 100th anniversary of the end of World War One, a conflict that claimed the life of Gallagher, who is All Black No97 . Despite being exempt from conscription because of his age, Gallagher enlisted and was serving as a company sergeant major when he died aged 43 from his wounds at Passchendaele after the action at Gravenstafel Spur in 1917. Wray told RugbyPass: “ The Dave Gallagher jersey is now at the museum and is the one from the Wales game which is famous for the “ was it a try?” by Bob Deans for the All Blacks. I regard Gallagher as a genuine hero because he falsified his age to enlist so he could fight in World War One after the death of one of his brothers. “ I also have Jonah Lomu’s jersey which he wore while running over England in 1995 and a couple of weeks before Jonah died I had breakfast with him and said to him “ Jonah, I have something to show you” and walked towards him with the Dave Gallagher jersey. That big man retreated before the jersey and said “ I think I know what that is”. That tells you about why the All Blacks are so good because they respect their past so much. Jonah took a selfie with the jersey and that is also at the museum. Gallagher was in the Ponsonby side which won the Auckland senior championship in 1897 and between 1896 and 1909 he played in 26 representative matches for Auckland. He was in the side which played the first Ranfurly Shield match against Wellington. Because of his service in the Boer War, as a corporal in the Mounted Rifles, he missed all of the 1901-02 seasons in New Zealand. A legacy of the England v New Zealand match staged at Crystal Palace on the 1905 tour is the whistle carried by the referee, Gil Evans, which was used to start the opening game of the first seven Rugby World Cup tournaments. Evans passed it on to another Welsh referee, Albert Freethy, who used it for the 1924 Olympic Games final in Paris that saw the United States beat France. In 1925 it was used to send All Black forward Cyril Brownlie off during their 17-11 victory over England at Twickenham sealing his place in history as the first player to be dismissed. It was later presented to All Black Invincibles manager Stan Dean, who gave it one of the founders of the New Zealand Rugby Museum in Palmerston North, John Sinclair, in 1969.